Mecalux designed and built an automated rack-supported warehouse for Special Dog, a Brazilian pet food business. It comprises two aisles both lined with double-depth racks and flow channels on one side. With this solution, the company receives a storage capacity of more than 6,000 pallets and can dispense product quickly to the 25,000 points of sale the company runs all over the country. Pallet sizes: 39” x 48” x 63” / 71"
Founded in the state of São Paulo (Brazil) in 1967, Special Dog has a long history of investigation and innovation, making them a forward-thinking company. It started doing business processing and selling coffee. Over time, it got involved in rice and flour production, which are used in different food industry sectors (mainly for children). Since 2001, it has specialized in cat and dog food. Currently, it offers a wide variety of products that focus on making pets healthier and happier. In the last few years, Special Dog has experienced unprecedented growth in Brazil. To shore up its position in the Latin American market, it sought out the collaboration of Mecalux to pinpoint a solution that would provide a large storage capacity, and at the same time speedy picking. 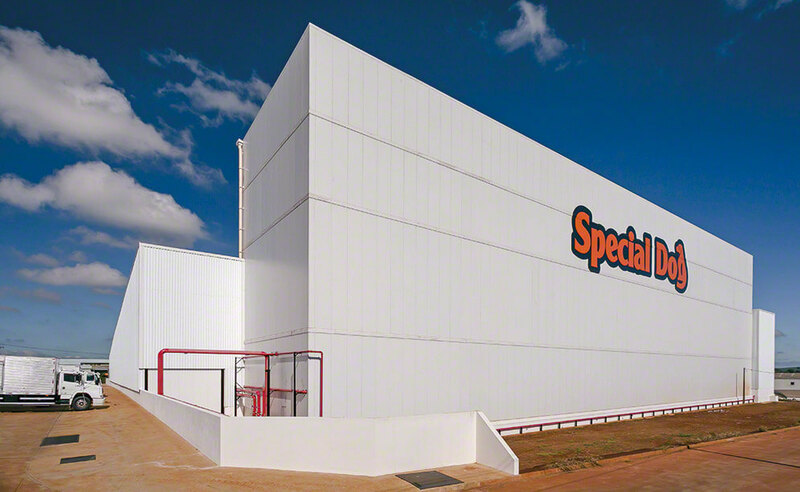 After analyzing the company’s needs, Mecalux erected a 13,993 ft2 automated rack-supported warehouse in the city of Santa Cruz do Rio Pardo, approximately 218 miles from São Paulo. The rack-supported installation is a building formed by racks that support their own weight, that of the goods, of the vertical cladding and roofing, as well as the thrusts by the stacker cranes. Its design anticipates certain factors that have an impact on the structure, such as the force of the wind, the seismic activity corresponding to the area and the local standards in force. The Special Dog installation measures 89' high and is composed of two 282' long aisles with double-depth racks on both sides. In each aisle, a single-mast stacker crane is tasked with moving products inside, from the conveyors up to the locations assigned by the Easy WMS warehouse management system by Mecalux. The stacker cranes work at a travel speed of 524 ft/min and 125 ft/min when raised, with a potential to handle approximately 100 pallets an hour. They are equipped with double-depth telescopic forks able to reach the second position on all levels. The warehouse contains an efficient fire-fighting system with smoke detectors and automatic sprinklers. These are spread out inside the racks and can turn on directly above the affected zone if a fire ensues. A roller conveyor circuit is tasked with the automatic inputs and outputs of goods, eliminating any sort of human ­involvement. Operators, aided by pallet trucks, deposit the goods in the entry stations and a hydraulic table lifts the load to the input conveyor’s level. From there, they flow to the checkpoint, where their characteristics are verified, and it is checked whether they fulfill the established warehouse parameters. Pallets that do not pass the inspection are ejected from the circuit to be reconditioned. The output conveyor, placed in parallel to the input one to avoid mix-ups between the two operations, is set up to handle full pallets leaving the warehouse and heading straight to ­dispatch. Lower rack levels coincide with the dispatch areas, where 58 flow channels are enabled. Each channel can house up to three pallets. When a reserve pallet is used up, Easy WMS by Mecalux gives the stacker cranes the order to replenish the channels with goods automatically. With this system, there are always goods available, and this avoids interruptions during order picking. Operators crisscross the flow channels with order pickers, locating SKUs to insert into each order. The WMS by Mecalux instructs personnel which location to go to by means of RF devices and, once there, they collect products directly off the pallets. The Easy WMS warehouse management software by Mecalux controls all warehouse processes and operations, such as the incoming goods, their location in the warehouse based on assignment rules and algorithms, the pallets being sent to the flow channels or directly to the exit conveyor, and order preparation. Easy WMS by Mecalux is in permanent, bi-directional communication with the ERP of Special Dog, interchanging information in order to increase the throughput of the installation. The Galileo control module sends commands to the automatic equipment in the warehouse, such as the AS/RS stacker cranes and the conveyor circuit. Storage capacity: in a 13,993 ft2 area, the Special Dog rack-supported warehouse provides a capacity for more than 6,000 pallets. Smooth picking system: the installation of flow channels expedites picking tasks, keeping goods always on hand to be picked. Precise warehouse management: it is managed by the proficient Easy WMS from Mecalux and the Galileo control module, capable of boosting the installation’s throughput.